Figure 1. 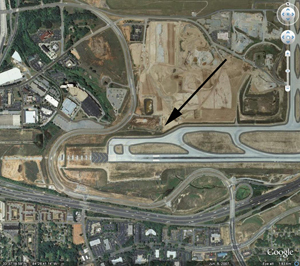 Google Earth map showing western end of fifth runway at Hartsfield-Jackson International Airport, with location of Hart Cemetery indicated by arrow. Figure 2. The Hart Cemetery in 1984. Liberty Baptist Church Education building is at right. 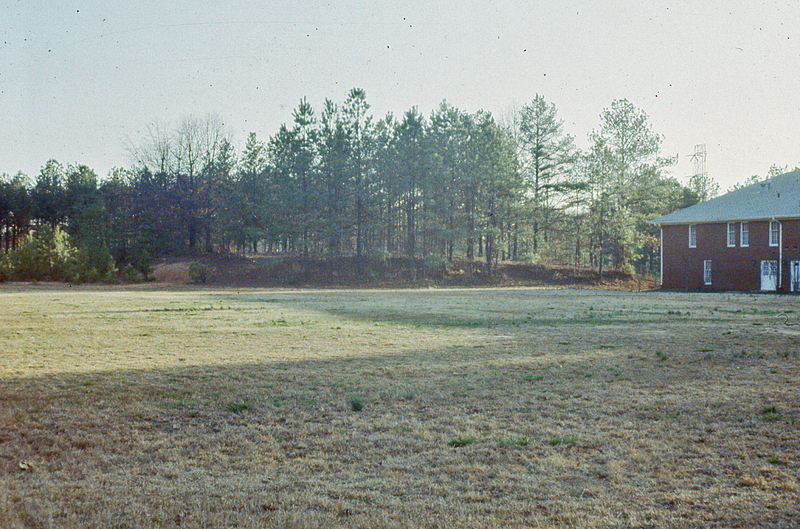 The field in the foreground was leveled in the 1970s. Figure 3. 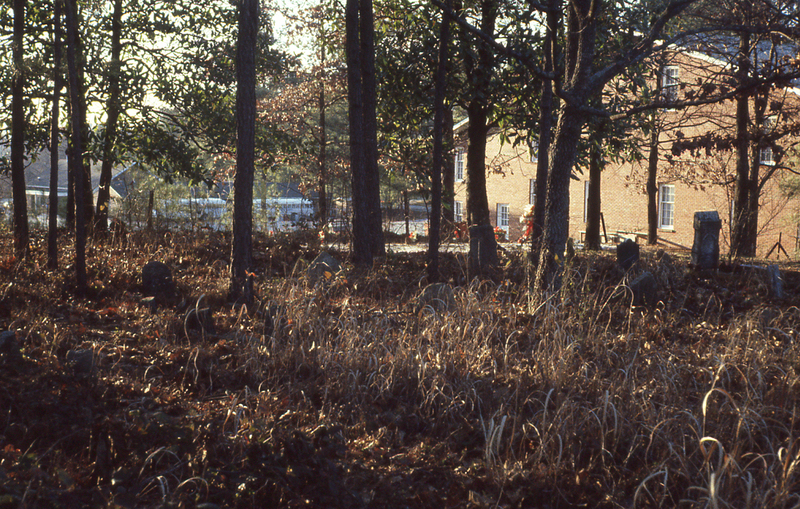 The Hart Cemetery, lookinig south, 1982. Figure 4. 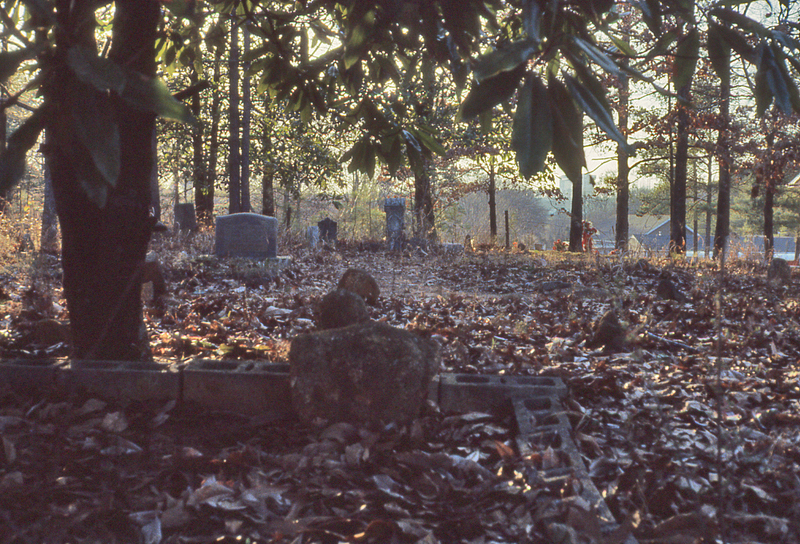 The Hart Cemetery, looking west, 1984. Figure 5. 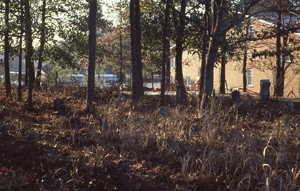 The Hart Cemetery, looking northwest, 1984. Figure 6. Gravestone for John J. Hart (1816-1898). Established in 1860 with the burial of Ellender Brown Hart (1822-1860), the Hart Cemetery also contains the remains of her husband, John J. Hart (1816-1898), and their oldest son, William Jasper Hart (1841-1864), as well as John Hart's second wife, Elizabeth Morgan Hart (1835-1892) and their son Henry C. Hart (1866-1937). The first wife of John J. M. Hart (1850-1914), Matilda Kimberly (1860-1882), and their son are also buried in the Hart Cemetery as well as four children of John J. M. Hart and his second wife, Jimmie Ophelia Ragsdale (1867-1927). Nancy Charlotte Morgan (1851-1917) is probably buried here as are her husband, Thomas Jefferson Phillips, and four of their children. The Phillips family was related to the Hart family in two ways: Nancy Morgan was Elizabeth Morgan Hart's sister and T. J. Phillips' brother James Monroe Phillips married John and Ellender Hart's daughter Susannah. 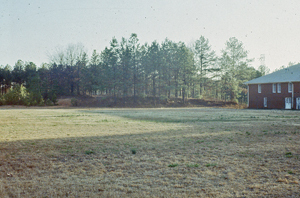 Planned construction of the fifth runway at Hartsfield-Jackson International Airport included preservation of the Flat Rock Cemetery and the Hart Cemetery. The map below and most of the narrative that follows were taken from documentation compiled by Garrow & Associates in 1998-1999 as part of the Federal Aviation Administration's compliance with the National Environmental Policy Act and the National Historic Preservation Act. The Hart Cemetery is located behind an abandoned church building near 4860 West Fayetteville Road in College Park, Georgia. The planned construction of a fifth runway adjacent to Hartsfield-Atlanta International Airport will affect the historic Hart Cemetery. 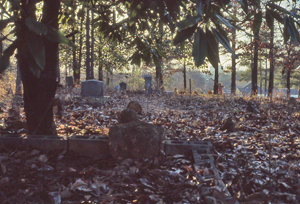 Pursuant to the Georgia Abandoned Cemeteries and Burial Grounds Act (§36-72), a permit application must be prepared for all proposed development projects that involve the preservation or removal of a cemetery. This report serves as the "Genealogist's Plan" required as part of the permit application outlined in Georgia Code §36-72. The cemetery will be preserved in place. The following pages present a family tree that comprehensively illustrates the Hart Family genealogy, as far as could be determined by the current research. The archaeological delineation conducted by TRC Garrow Associates, Inc., in April 1995 identified 14 graves in the Hart Cemetery marked with formal, inscribed headstones and an additional 69 unmarked graves, for a total of 83 graves. Jeffrey L. Holland and Kristin J. Wilson of TRC Garrow Associates, Inc., conducted the genealogical research on the Hart Cemetery in August and September 1997. Records were consulted at the Georgia Department of Archives and History and at the National Archives Branch in East Point, Georgia. Family documents in the possession of Mr. Tommy Hart Jones provided additional pertinent information. Ms. Melba Hart Dailey and Ms. Betty Ragsdale Conkle shared genealogical and historical information about the Hart family and their descendants. The property on which the cemetery is located has been in the possession of the Hart family since 1848, when it was purchased by John J. Hart and his first wife, Ellender (Nellie) Brown Hart. According to family documents drafted in 1943 by J. M. Hart, son of John J. and Nellie Hart, the hilltop now containing the cemetery was chosen by Nellie Hart as her preferred burial ground. She died in 1860 and was the first person interred at the Hart Cemetery. Subsequently, many of her descendants and relatives were buried there. William J. Hart, the second person buried in the Hart Cemetery, was a Confederate soldier who deserted during the war. He was traveling to Washington, D.C., to be granted a pardon for desertion by the United States government when he was hit and killed by a train. Family oral history accounts indicate that the family was opposed to slavery and did not wholeheartedly support the rebellion by the Southern states. Several of the sons of John J. Hart, by his first wife, Nellie, and his second wife, Elizabeth Morgan, remained on or adjacent to the original property. In fact, over a century later, many of their descendants are still living in the area, and several just recently moved as a result of airport expansion. However, possibly in response to an argument over inheritance, some of the children of John J. Hart, including George Stovall Hart, John James Marion Hart, Louis Gideon Hart, and Susannah C. Hart, moved to Alabama after 1880. Most of the members of these families were buried in Alabama. The Hart family was still using the Hart Cemetery as late as the 1940s, as indicated in family documents. Individuals reasonably believed to be buried in the Hart Cemetery are listed below. According to family documents, several other members of the Hart family were buried in nearby Flat Rock Cemetery, which belonged to Flat Rock Baptist Church. Several living descendants of the Hart family were notified of the proposed development project. Ms. Melba Hart Dailey was elected as chairperson and secretary of the Hart Cemetery in 1943. She continues to reside in a house near the cemetery and has been an active advocate for its preservation and care. Ms. Dailey and Mr. Tommy Hart Jones were key in notifying their relatives of the construction plans that would impact the environment in which the Hart Cemetery is located. 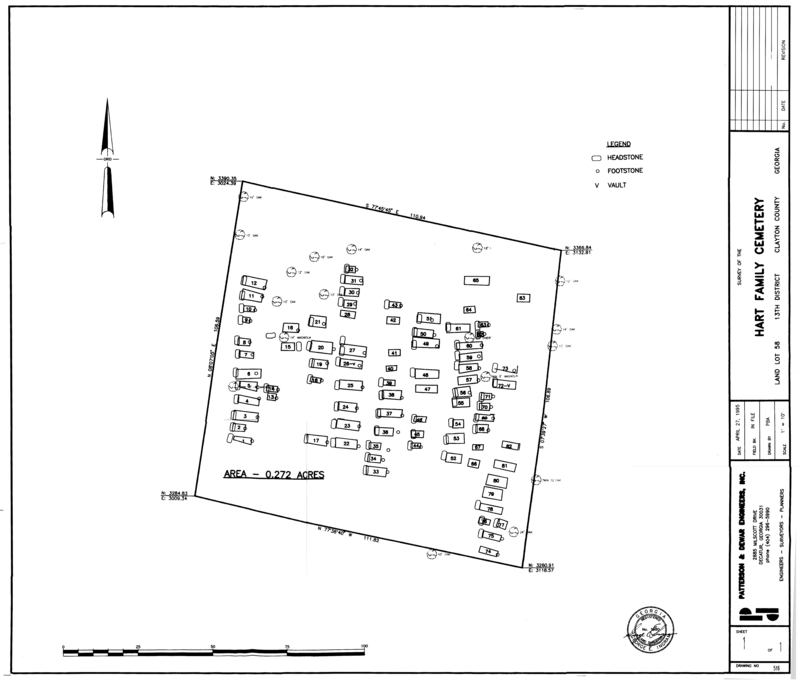 The archaeological delineation of the Hart Cemetery was conducted by Patrick H. Garrow, Brandy Garrow, and Jake Enslin of TRC Garrow Associates, Inc., on April 13-14, 1995. The delineation was conducted to determine the number of graves present and their distribution, so that firm cemetery boundaries could be established. Eighty-three graves were located through systematic probing, using a steel probe with a replaceable, case-hardened steel tip; the probe was 3 feet long and an eighth inch in diameter. A probe station was placed every 6 inches along north-south transects, which were 4-5 feet apart along the entire landform. The delineation confirmed that the visual boundaries of the cemetery include all of the graves present. The cemetery appears to be confined to an area approximately 100 x 100 feet, which is consistent with Hart family documents pertaining to the cemetery. The number of graves found in the Hart Cemetery is concordant with oral history in the Hart family. It was believed prior to the delineation that 60-80 graves were present in the cemetery by the 1930s. A few additional graves that postdate the 1930s were found during the probe investigation. Only 16 of the 83 graves had inscribed headstones; most graves were marked by fieldstones or formal headstones and footstones. The Hart Cemetery is organized into 11 north-south rows. The grave pits are oriented east-west, as is standard practice in Protestant cemeteries. Feature numbers were assigned to all anomalies believed to be graves and were given in sequence from the south end of the westernmost row to the north end of the easternmost row. The relatively large size and irregular shape of many of the adult graves are consistent with the Euro-American practice of grave digging by several family members. Typically, a pit was dug to a point that corresponded to the top of the coffin. From that point onward, the hole was excavated to the exact dimensions of the coffin, leaving a ledge that was normally about 6 inches wide. Note: Although the archaeology is reported in the past tense, most of the recorded features remain intact. ROW 1, the westernmost row in the cemetery, contained 12 features believed to be graves. Features were numbered from south to north. Feature 1 measured 5.8 feet east-west by 2.0 feet north-south. The head and foot were marked by shaped fieldstones. A vault was discovered during probing. The size of the pit suggests that Feature 1 is the grave of an adult. Feature 2 measured 4.15 feet east-west by 2.4 feet north-south. These dimensions are consistent with the grave of a child. The head and foot were marked by shaped fieldstones. Feature 3 measured 8.2 feet east-west by 3.2 feet north-south. The pit probably contains the remains of an adult. The head and foot are marked by shaped fieldstones. Feature 5 measured 6.1 feet east-west by 2.55 feet north-south. The grave is marked by shaped fieldstones at the head and foot and may contain the remains of an adult. Feature 6 measured 8.3 feet east-west by 3.0 feet north-south. Shaped fieldstones mark the head and foot. The grave is probably that of an adult. Feature 7 measured 5.0 feet east-west by 2.3 feet north-south. Shaped fieldstones mark the head and foot. The relatively small size of the pit suggests that the grave is that of a child or adolescent. Feature 8 measured 4.0 feet east-west by 3.5 feet north-south. Shaped fieldstones mark the head and foot. The footstone was lying flat on the ground surface. This is probably the grave of a child. Feature 9 measured only 2.45 feet east-west by 1.7 feet north-south and is probably an infant's interment. Shaped fieldstones were present at the head and foot. Feature 10 measured 3.65 feet east-west by 1.9 feet north-south and likely contains a child. Shaped fieldstones marked the head and foot of the pit. Feature 11 measured 6.825 feet east-west by 3.3 feet north-south. Shaped fieldstones were found at the head and foot. The size of the pit is consistent with an adult's grave. Feature 12 measured 7.8 feet east-west by 3.1 feet north-south. There was no headstone, but a shaped fieldstone was present at the foot. This is likely the grave of an adult. ROW 2 was located east of Row 1 and was made up of two graves. An unassociated, shaped fieldstone inscribed with "Mrs. T. H." was found between Rows 1 and 2. Feature 13 measured 2.7 feet east-west by 2.1 feet north-south. This probable child's grave was marked only by a shaped fieldstone footstone. Feature 14 measured 3.6 feet east-west by 2.0 feet north-south. Shaped fieldstones were present at the head and foot of this probable child's grave. ROW 3 was located east of Row 2. 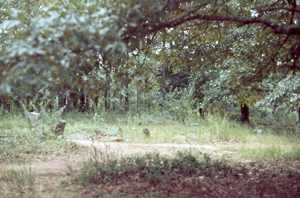 The two graves in the row were separated by a large magnolia tree. Feature 15 measured 4.45 feet east-west by 2.45 feet north-south. No markers were present on this child-sized grave. Feature 16 measured 5.1 feet east-west by 2.9 feet north-south. A shaped fieldstone was present at the foot of this grave. ROW 4, located east of Row 3, contained five graves. Feature 17, the southernmost grave in Row 4, measured 7.25 feet east-west by 3.0 feet north­south. Shaped fieldstones marked the head and foot of the grave. A broken border of brick was present around the grave. At least some of the bricks were handmade, and some were set in mortar. The size of the pit suggests that this grave belongs to an adult. Feature 18, located several feet north of Feature 17, measured 3.5 feet east-west by 1.6 feet north-south. Unmodified fieldstones were present at the head and foot of this probable child's grave. Feature 19 measured 5.2 feet east-west by 2.75 feet north-south. Shaped fieldstones marked the head and foot. This grave is likely that of an adolescent. Feature 20 measured 7.1 feet east-west by 3.75 feet north-south. The headstone and footstone were made of shaped fieldstones. The grave is outlined with upright, modified rock slabs. This interment probably contains the remains of an adult. Feature 21 measured 5.75 feet east-west by 3.7 feet north-south. The headstone was a shaped fieldstone; no marker was present at the foot. The grave likely belonged to an adolescent or a small adult. ROW 5 was located east of Row 4. Row 5 contained 11 graves, 10 of which are marked by inscribed headstones. Feature 22 measured 7.13 feet east-west by 3.3 feet north-south. Shaped fieldstones marked the head and foot. According to family oral tradition, Elizabeth Brown Hart, the second wife of John J. Hart, was buried in this plot in 1892. Feature 23 measured 8.7 feet east-west by 3.0 feet north-south. Shaped fieldstones marked the head and foot. Initials on the headstone read "J. J. H.". This grave is probably that of John J. Hart, who was born in 1816 and died in 1898. Vertical, shaped stones outline the grave. Feature 24 measured 6.25 feet east-west by 2.9 feet north-south. Shaped fieldstones marked the head and foot. This grave is thought to contain the remains of Ellender Morgan Hart, the first wife of John J. Hart. Family documents record that she was the first person buried in the cemetery; she died in 1860. Vertical stones border the grave. Feature 25 measured 7.8 feet east-west by 3.2 feet north-south. Shaped fieldstones marked the head and foot of the grave. The headstone bore the barely legible inscription "W. J. Hart". William Jasper Hart died in 1864 at the age of 20 years. A border of vertical stones surrounds the grave. The footstone was lying flat on the ground. A vault was detected below the ground surface during the probe investigation. The footstone bore the initials, "M. J. H.". A border of vertically set, shaped stones surrounds the grave. An unassociated white marble base was found just north of Feature 27. Feature 28 measured 5.0 feet east-west by 2.3 feet north-south. No markers were present. This grave may contain the remains of a child or adolescent. Vertically set, shaped stones border the grave. Feature 30 measured 4.7 feet east-west by 2.8 feet north-south. The footstone bore the inscription, "I. S. H.". As mentioned above, the headstone was vandalized and placed over Feature 29. The headstone was inscribed with "IRENE S. HART". Vertically set, shaped stones border the grave. Feature 31 measured 6.3 feet east-west by 2.8 feet north-south. Only a white marble base remained in the place of the headstone. The footstone read "F. R. H.". Vertically set, shaped stones border the grave. It is not known which member of the Hart family was buried in this plot, but the size of the pit suggests that it was an adult. ROW 6, located east of Row 5, contained 11 graves. The identities of the 11 individuals interred in Row 6 are unknown. Feature 33 measured 6.3 feet east-west by 2.9 feet north-south. The grave is marked at the head and foot by plain, unmodified fieldstones. It is likely that an adult is buried here. Feature 34 measured 4.3 feet east-west by 2.5 feet north-south. Shaped fieldstones mark the head and foot of this child's grave. Feature 35 measured 3.8 feet east-west by 2.4 feet north-south. Shaped fieldstones were present at the head and foot of the grave. The remains of a child were likely buried here. Feature 36 measured 6.0 feet east-west by 2.7 feet north-south. A shaped fieldstone headstone and a shaped fieldstone footstone were present. The size of the grave is consistent with that of an adult. Feature 37 measured 8.0 feet east-west by 2.7 feet north-south. Shaped fieldstones marked the head and foot. The grave may contain the remains of an adult. Feature 38 measured 6.2 feet east-west by 3.0 feet north-south. The head and foot of the grave were marked by shaped fieldstones. An adult is probably interred in this grave. Feature 39 measured 3.9 feet east-west by 2.0 feet north-south and may contain the remains of a child. A shaped fieldstone was present at the head of the grave; no marker was present at the foot. Feature 40 measured a child-sized 3.5 feet east-west by 1.8 feet north-south. The grave was not marked. Feature 41 measured 3.7 feet east-west by 2.2 feet north-south and probably contains the remains of a child. No markers were present on this grave. Feature 42 measured 4.2 feet east-west by 2.5 feet north-south. No markers were present on this child's grave. Feature 43 measured 4.0 feet east-west by 1.95 feet north-south. There was a plain fieldstone at the head and a shaped fieldstone at the foot. This is probably the interment of a child. ROW 7 was east of Row 6. Eight graves are contained in Row 7. Feature 44, the southernmost grave in Row 7, measured 3.1 feet east-west by 1.8 feet north­south. Shaped fieldstones mark this grave at the head and foot. The size of the grave is consistent with that of a child. Feature 45 measured 4.0 feet east-west by 2.25 feet north-south. A shaped fieldstone was present at the head, but no marker was present at the foot. This small grave probably contains the remains of a child. Feature 46 measured 4.0 feet east-west by 1.9 feet north-south. A shaped fieldstone served as a headstone; there was no footstone present. The size of the grave is consistent with that of a child. Feature 47 measured 7.3 feet east-west by 2.7 feet north-south. A concrete border marked the grave. The grave may be that of an adult. Feature 50 measured 6.6 feet east-west by 2.75 feet north-south. No markers were present. The grave is a size that would be expected for an adult. Feature 51, the northernmost grave in Row 7, measured 7.7 feet east-west by 3.2 feet north­south. A shaped fieldstone served as the headstone; no footstone was present. The size of the grave is consistent with that of an adult. ROW 8, located east of Row 7, contained 14 graves. Feature 52 measured 5.2 feet east-west by 3.1 feet north-south. A shaped fieldstone marked the head; no footstone was present. The grave may contain the remains of an adolescent or child. Feature 53 measured 6.0 feet east-west by 3.5 feet north-south and was marked by a shaped fieldstone headstone that had apparently fallen out of place. This is probably an adult's grave. Feature 54 measured 3.7 feet east-west by 2.9 feet north-south. The head was marked by a shaped fieldstone, and no other markers were present on this child's grave. Feature 55 measured 5.7 feet east-west by 3.0 feet north-south. The head was marked by a shaped fieldstone that had been vandalized. No other markers were present. The size of the grave is consistent with that of an adolescent or small adult. Feature 56 measured 5.5 feet east-west by 3.3 feet north-south. Both the head and foot were marked by shaped fieldstones. The headstone showed evidence of vandalism. The grave may contain the remains of an adolescent or small adult. Feature 57 measured 6.5 feet east-west by 2.7 feet north-south. Both the head and foot were marked by vandalized, shaped fieldstones. The headstone was inscribed "T. U. P.". This grave is likely that of an adult member of the Phillips branch of the family. Feature 58 measured 6.6 feet east-west by 2.95 feet north-south. Shaped fieldstones marked the head and foot of this probable adult grave. Feature 59 measured 7.4 feet east-west by 2.6 feet north-south. The grave was marked by a headstone and a footstone of shaped fieldstones. The size of the grave is consistent with that of an adult. 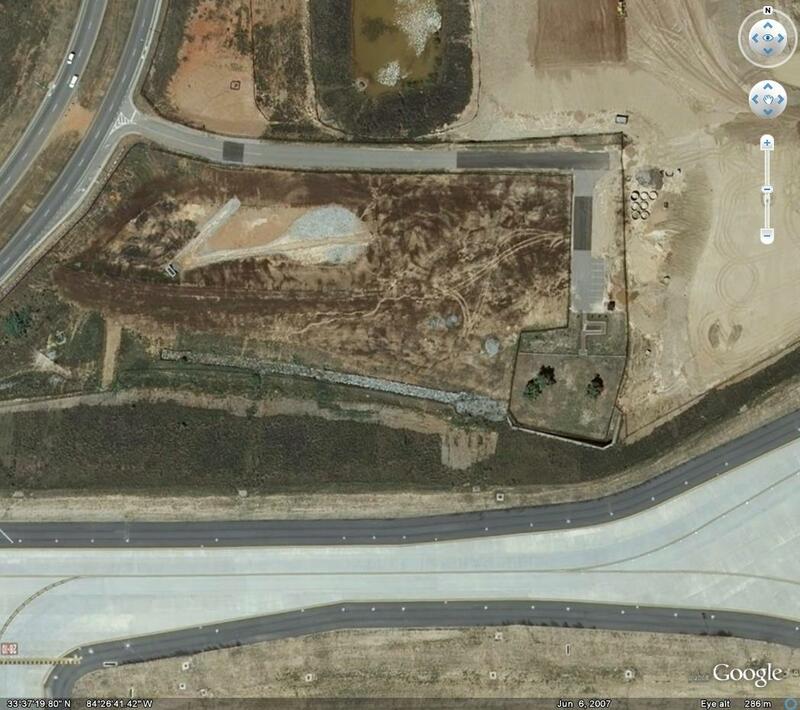 Feature 61 was 7.7 feet east-west by 3.3 feet north-south. An inscribed, shaped fieldstone served as the headstone. Unfortunately, the inscription, which appeared to be on both sides, was no longer legible. No footstone was present, but a concrete border marked the perceived boundaries of this probable adult grave. The angle of this grave was offset somewhat from the rest of the graves in the row. Feature 62 measured 2.2 feet east-west by 1.8 feet north-south. Shaped fieldstones marked the head and foot of this infant or child grave. Feature 63 measured 3.4 feet east-west by 1.8 feet north-south. An unmodified fieldstone was present at the head; no footstone was found. This grave is probably a child's grave. Feature 64 measured 3.8 feet east-west by 2.1 feet north-south. No markers were present on this probable child's grave. Feature 65 measured 8.2 feet east-west by 3.0 feet north-south. No markers were present. The size of the grave is consistent with that of an adult. ROW 9 was located east of Row 8. Six graves were contained in Row 9. Feature 66 measured 3.65 feet east-west by 2.6 feet north-south. No markers were present on this probable child's grave. Feature 67 measured 3.5 feet east-west by 1.8 feet north-south and likely contained the remains of a child. No markers were present. Feature 68 measured 4.0 feet east-west by 2.75 feet north-south and was probably the grave of a child. No markers were present. Feature 69 measured 6.2 feet east-west by 2.4 feet north-south. A vandalized, shaped fieldstone marked the head; no footstone was present. The grave is the right size for an adult. Feature 70 measured 3.35 feet east-west by 2.4 feet north-south. Shaped fieldstones marked the head and foot of the grave. This grave was small and probably contains the remains of a child. Feature 71 measured 3.7 feet east-west by 2.2 feet north-south. 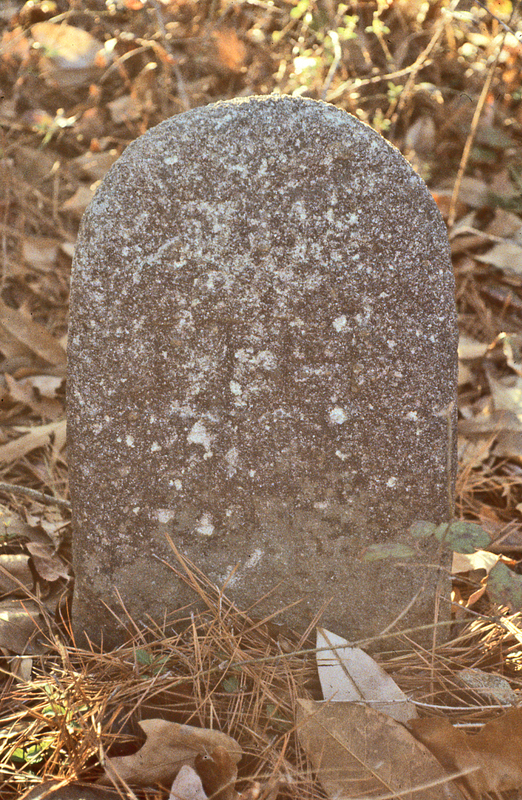 Shaped fieldstones marked the head and foot of this probable child's grave. ROW 10 was located east of Row 9. Row 10 contained two adult-sized graves. No footstone was present. A cinder block border encompasses Feature 72 as well as Feature 73. Feature 73 measured 7.2 feet east-west by 2.5 feet north-south. A shaped fieldstone was located at the head, and a large quartz cobble was set at the foot. This grave shares a cinder block border with Feature 72, and the individual interred in Feature 73 may be the wife of Jessie C. Sims, who was interred in Feature 72. ROW 11 was the easternmost row in the cemetery. Ten graves were found in Row 11, which is somewhat irregularly organized. Feature 74 measured 6.15 feet east-west by 2.0 feet north-south. No headstone was present, but a shaped fieldstone marked the foot of the grave. The grave is probably that of an adult. Feature 75 measured 6.15 feet east-west by 2.2 feet north-south. No headstone was present. A shaped fieldstone marked the foot of this adult-sized grave. Feature 76 measured 3.5 feet east-west by 1.8 feet north-south; it is likely the grave of a child. A shaped fieldstone marked the head. No footstone was present. Three fragments of a white marble headstone were scattered over the grave. The pit is large and likely contains the remains of an adult. According to Hart family documents, Mollie Sweat was buried here. Feature 79 measured 6.4 feet east-west by 3.6 feet north-south. No markers were present on this probable adult grave. Feature 80, which was unmarked, measured 6.8 feet east-west by 3.6 feet north­south. The grave is likely that of an adult. Feature 81 measured 7.2 feet east-west by 2.6 feet north-south. No markers were present. The grave is likely that of an adult. Feature 82 measured 5.6 feet east-west by 2.2 feet north-south, suggesting that it belonged to an adolescent or small adult. No markers were present. Feature 83 measured 4.2 feet east-west by 2.7 feet north-south. No markers were present on this probable child's grave.